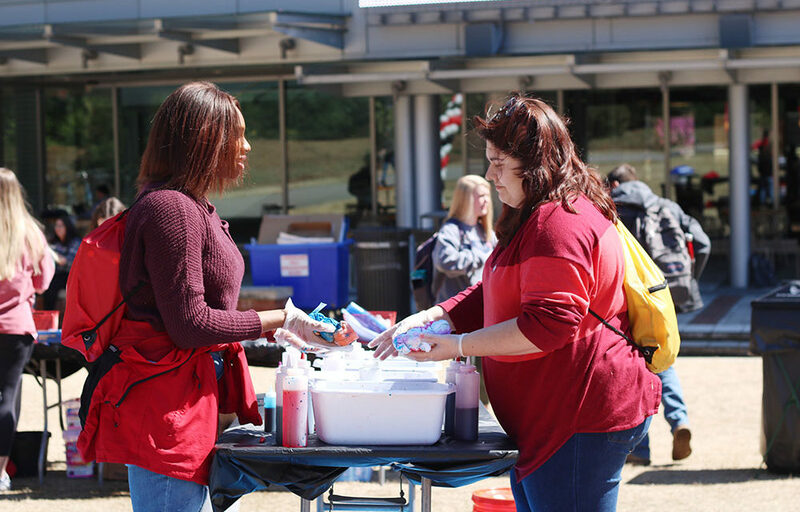 Ashley Graham, a fourth-year studying finance and accounting, and Alexandria Gilmore Harris, a fourth-year studying business administration and marketing, dye t-shirts at an event for NC State’s Day of Giving at Stafford Commons on Wednesday, March 27, 2019. NC State’s first Day of Giving raised $13.5 million from 10,810 gifts to several funds and endowments across campus on Wednesday, March 27. During the day, people had the opportunity to give to colleges and other campus programs, like student affairs and NCSU Libraries. Many organizations on campus collaborated to teach students about the purpose of Day of Giving, like the NC State chapter of the National Association for the Advancement of Colored People (NAACP). Berkeley Bryant, the social media specialist for the College of Natural Resources, talked about the positive impact that the Day of Giving can have on the university. Overall, many students had a similar opinion on the event. They liked the idea of people choosing a specific destination for their donations. Students were encouraged to participate in the Day of Giving activities held around campus, like signing their names and writing messages of where they hope the money will be contributed. Other students talked about how Day of Giving was able to help them with their school fees and to continue to raise awareness. Olivia Adcox, a fourth-year studying biological sciences, talked about what can be done to raise awareness on this matter. Mulligan said the overall goal was to raise awareness for philanthropy and that giving back makes a good impact. NextLetter to the Editor: Racial Bias in Reporting “Safety” Issues?